When asked “what is the one invention you wouldn’t want to live without?”, I’d have to say it’s this little darling…the hot water bottle. I am cold from October through May and keep a hot cuddle bottle at my feet every night. We turn our heat way down at night to save energy, so the whole house is pretty chilly. We pile on the blankets, but a cuddle bottle feels like such a luxury! When I was a little girl, my mom would fill the hot water bottle with warm water and I would carry it around, pretending it was a wiggly, giggly little baby. When I was pregnant in 2006 and visiting Sonya, I told that story to her daughter (she was probably 4); she thought that was the silliest thing I’d ever said and shook her head at the ridiculousness. 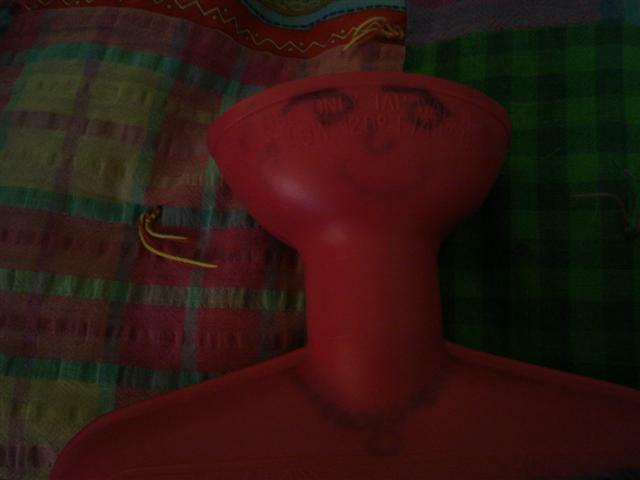 So I drew this face on my hot water bottle, filled it up, and left it in my guest bed. When I came back later, she had wrapped it up in a blanket and played with it all day while I was out. During that same vacation, I bought the yarn to knit Ms. Cuddle Bottle a sweater. 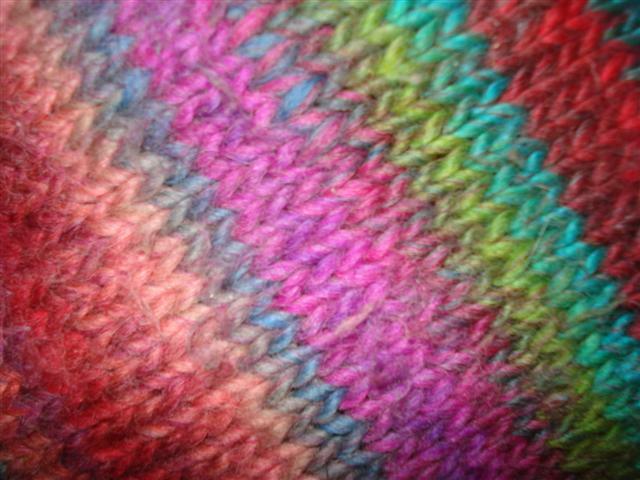 I used a Trensdetter yarn called Tonalita. It self-striped, and I went through two balls without ever seeing a repeat in pattern. It keeps getting softer and fuzzier. The face is still there, a reminder of a nice Thanksgiving visit. The quilt here is called “Wild as a March Hare”. My mom sent it to me when I lived in SF, and needed the bright colors to survive the foggy days. 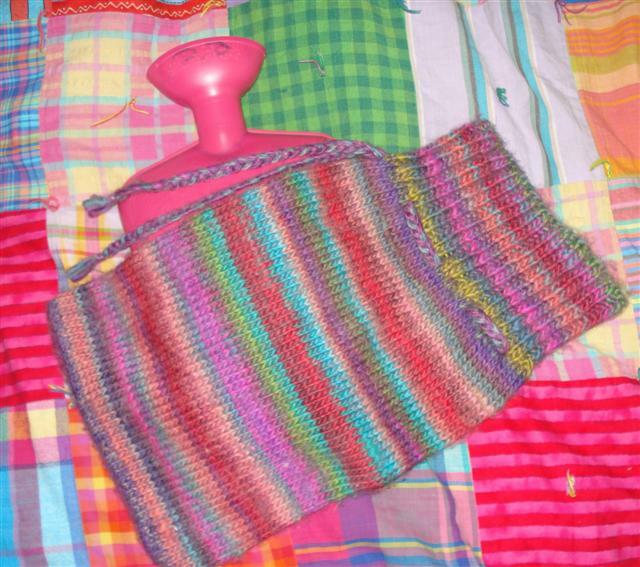 It features tons of madras plaids from old thrift store shirts, lots of oranges and hot pinks. * If you want to be as warm and cozy as I am, you can purchase a hot water bottle like this at most drugstores, but you must look for one that is non-latex. The latex ones smell funny, and they leave a weird red dust on your sheets. * Look for a fully plastic plug and seal, the metal ones don’t seal as well. * Dry the whole thing off after filling it with tryuly HOT water. Dry near the plug really well. Any drops that get in your bed cool down real quick, and damp sheets are NOT cozy. So wonderful! I think a knitted cozy is the way to go with the insulating magic powers of wool. And a little Beatrice nostalgia, awwww. We miss you guys!